The North River Education Committee identifies student voice as one of their five core initiatives. 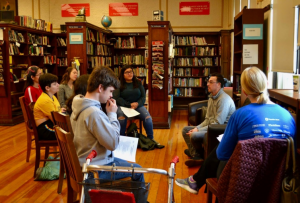 While the committee continually highlights and supports youth leadership and engagement in classrooms and schools, the committee wanted to provide Albany Park students the opportunity to become more engaged community-wide and with local elected officials. In the fall of 2016, North River Commission (NRC) convened a series of meetings with aldermen, principals, and student leaders in the 33rd, 35th, and 45th wards. While these meetings served to strengthen the relationships between schools and ward offices, as well as educate both parties about how they can support one another, the most interesting outcome came from the 33rd ward meeting. Roosevelt High School student leaders, Danely Quiroz and Ruby Ruiz, expressed the desire to create a 33rd Ward Aldermanic Youth Council. Ruiz and Quiroz were motivated to create a youth council for several different reasons. They didn’t believe young people’s voices were being adequately represented in local government. Roosevelt High School had suffered severe funding losses during the school years of 2015-2016 and 2016-2017, as well as concurrent administration turnovers. Therefore, the school lacked the funds and centralized leadership to advocate for students effectively. Ruiz and Quiroz felt the council would be a means to do so. At the urging of the NRC Education Committee, they composed and presented a proposal and a plan for the council, outlining who could be members, how often they would meet, and their underlying intentions for creating the group. In the Summer and Fall of 2017, the student leaders and committee members worked together to outline the council, recruit and interview potential members, and select a curriculum to structure it. The 33rd Ward Youth Council, which then consisted of ten members from five different CPS schools, was launched and began to meet in October of 2017. Leaning on Issues to Action Mikva Challenge Curriculum, the council chose to focus on the issues of immigrant safety, teen mental health, and youth political engagement. When Deferred Action for Childhood Arrivals (DACA) was threatened by the presidential administration last spring the youth council sprang into action. Collaborating with DREAMers clubs from Roosevelt High School and Von Steuben High School, as well as NEIU’s Undocumented Resilient and Organized student club, they organized the Coming Out of the Shadows Neighborhood March and Rally. They mobilized over one hundred students, residents, and other concerned citizens to visibly display support for immigrants, as well as to elevate the voices of immigrant youth and their stories. Two of the council members spoke about their own experiences of being undocumented and “DACAmented” at the rally, as well as created and shared immigrant resource sheets in English and Spanish. Ruiz, founder of the 33rd Ward Youth Council and current freshman at Loyola University, shares her reflections about that day. You can learn more about the event from this clip. Mental health is of concern to all, but especially for young people in Chicago Public Schools, where there is little to no funding for mental health counselors and supports. The 33rd Ward Youth Council is well aware of this fact, and have been advocating for fewer security guards and resource officers in favor of more mental health professionals in their schools. This past summer they had the opportunity to meet with State Attorney Kim Foxx to advise her office on this issue, as well as countless other concerns that impact youth. They have also met with Angela Sedeño, executive director of The Kedzie Center. Albany Park’s local community mental health clinic. Both conversations touched on empathy building, suicide prevention, and community resources available to young people. This fall they organized the 33rd Ward Youth Council Political Engagement Workshop to educate young voters about the midterm and municipal elections, and encourage them to vote. The council secured local experts to run pieces of training on demystifying the voting process, the importance and responsibilities of local government, and an explanation of the midterm ballot. Over 30 students participated and reported on their evaluations that, after attending, they are now more likely to become politically active. Continuing to focus on youth political engagement, the council is now learning about the 33rd Ward Aldermanic and Mayoral Races. They have met and interviewed the three 33rd Ward Aldermanic candidates about issues of most concern to them. They are on the planning committees and volunteering at both the 33rd Ward Aldermanic Forum on Wednesday, January 30 7–8:30 p.m. at Bateman Elementary and the Chicago Communities Mayoral Forum on Tuesday, February 5 7–8:30 p.m. at Roosevelt High School. The council meets weekly to plan the aforementioned events and projects, as well as monthly with Alderman Mell to advise her on youth perspective in the ward. In addition, they run an ongoing social media campaign called “We Are Albany Park” which aims to celebrate, lift up and to unite the people of their community. Check out their Facebook and Instagram pages to learn more. Maya Roman, Sophomore at Lane Tech, speaks about her experience on the youth council. The National Center for Urban Education and Chicago Teacher Education Pipeline partner with NRC to promote “community-minded teachers” to participate in events like this that are presented by students, teachers, and families within the Chicago communities where teacher candidates student teach. The goal is to learn about community needs from the community members directly and shift the teacher-student dynamic to be more reciprocal and community-centered.